Barred Owl, hit on the road just outside Willapa Bay National Wildlife Refuge in Washington. There were two known breeding pairs nesting at the refuge. This barred owl is thought to belong to one of those pairs. 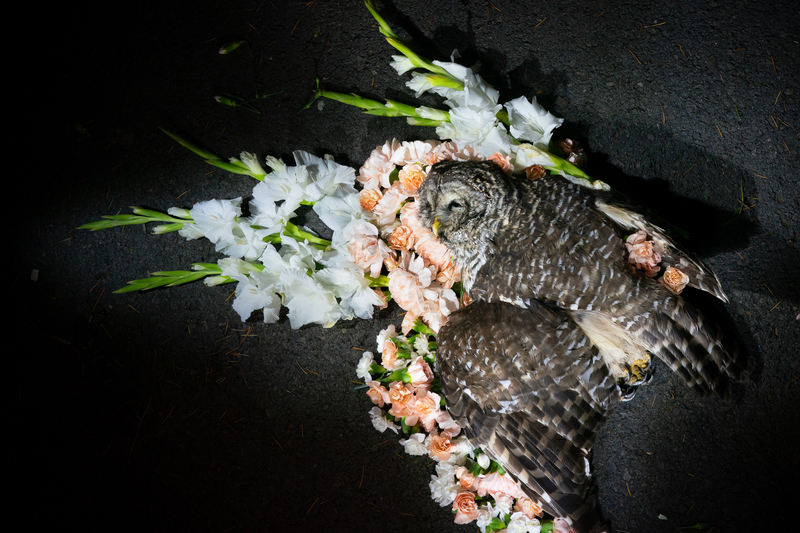 I try to photograph wildlife exactly where they are found, but biologists had already picked this owl up to send for necropsy and further study. I got permission to lay the owl down in the parking lot of the refuge in order to make this portrait. Barred owls are a controversial animal of the West, an invasive species that often outcompetes federally threatened northern spotted owls. That is neither here nor there. Fall is a dangerous time for many species, including owls when young are fledging from nests.